VIN SCULLY IS MY HOMEBOY: Sell now! Can it really happen? Did Frank McCourt finally realized he needs to go? I'm thinking positive. All this will end soon. 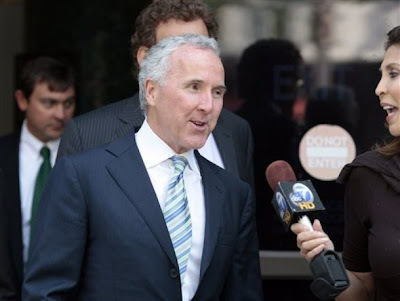 The Dodgers' bankruptcy trial has been postponed for one month so Dodgers owner Frank McCourt and Major League Baseball can explore a possible settlement under which McCourt would agree to sell the team, multiple people familiar with the matter said Wednesday. McCourt discussed a potential settlement with league officials Monday and Tuesday, said the people, none of whom were authorized to comment on the confidential talks. U.S. Bankruptcy Judge Kevin Gross announced the postponement in a one-sentence order on Wednesday, without citing a reason for the delay. The four-day trial had been set to start Monday. Gross postponed the trial to Nov. 29. Neither the Dodgers nor the league would comment Wednesday, according to their respective spokesmen. Sell! Sell! Sell! Sell! Now!